Little, Brown Books for Young Readers, 9780316199988, 40pp. Dan Santat's Caldecott Medal-winning The Adventures of Beekle: The Unimaginary Friend is a humorous and thoughtful celebration of friends. This magical story begins on an island far away where an imaginary friend is born. 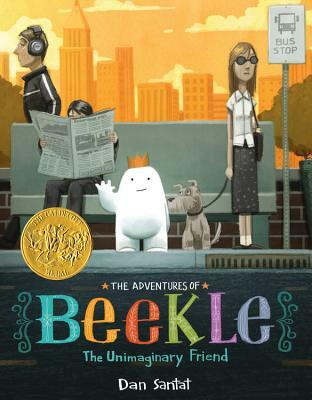 He patiently waits his turn to be chosen by a real child, but when he is overlooked time and again, he sets off on an incredible journey to the bustling city, where he finally meets his perfect match and--at long last--is given his special name: Beekle. The #1 New York Times bestselling and award-winning author and illustrator Dan Santat--creator of After the Fall and Are We There Yet?--combines classic storytelling with breathtaking art in an unforgettable tale about friendship, imagination, and the courage to find one's place in the world. Dan Santat is the Caldecott Medal-winning and New York Times bestselling author and illustrator of The Adventures of Beekle: The Unimaginary Friend, Are We There Yet?, and After the Fall as well as the illustrator of many other picture books, including Crankenstein by Samantha Berger. Dan lives in Southern California with his wife, two kids, and various pets. He invites you to visit him online at dantat.com. "How does an imaginary friend feel before he's been imagined? In Santat's sweet, mind-bending gumdrop of a tale, Beekle lives on a rainbow-hued island, 'hoping for his turn to be picked by a child.' Eventually, like Max in 'Where the Wild Things Are,' he takes to the seas and soon lands in the real world - which looks a lot like Manhattan. Though this island seems awfully drab, Beekle and his friend find each other at last. She's everything he's ever dreamed of, and the feeling is mutual." Dan Santat is one of the hardest working people in the industry today. And while his immense talent was always evident, Beekle takes his artistry to a new level. The story (which is just bursting at the seams with charm) begins on an island of colorful creatures, each waiting to be imagined by a special child and thus transported to the real world.... As with all great books, Beekle has an air of inevitability about it. As if somewhere out there is an island of perfect stories just waiting for the right person to come along and imagine it into being. We should all be grateful that Santat, with his brilliant use of color and humor, was here to bring Beekle to life.